The Gimbal Rail Clamp for Remote Focus attaches to the hot shoe of any camera to provide a pair of 15mm rail clamps, ideal for attaching the motor of a remote focus system. The Rail Clamp replaces the need for a heavy camera baseplate while operating any gimbal based stabilizer. This reduces the weight of the overall system, allowing not only for longer shooting times without operator fatigue, but also the creative freedom to use a wider variety of lenses. 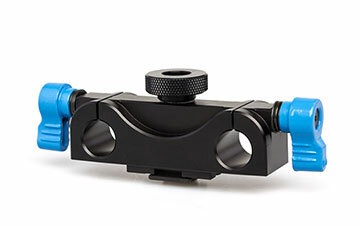 The Gimbal Rail Clamp for Remote Focus features a pair of industry standard 15mm rail clamps. This allows for the remote focus motor to be placed on either side of the camera for optimal balance. The ability to choose specific rail length also sheds any unnecessary weight on the rig. 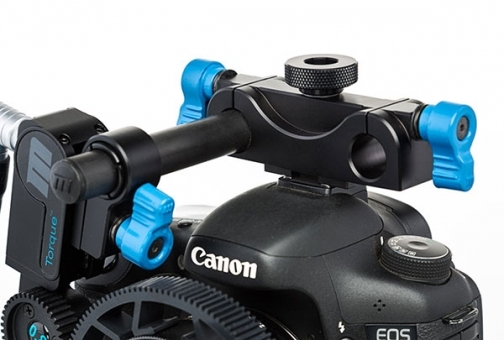 The Gimbal Rail Clamp for Remote Focus secures to the hot shoe of any camera by tightening its large knurled screw. This allows the Rail Clamp to be attached and removed securely without any tools.